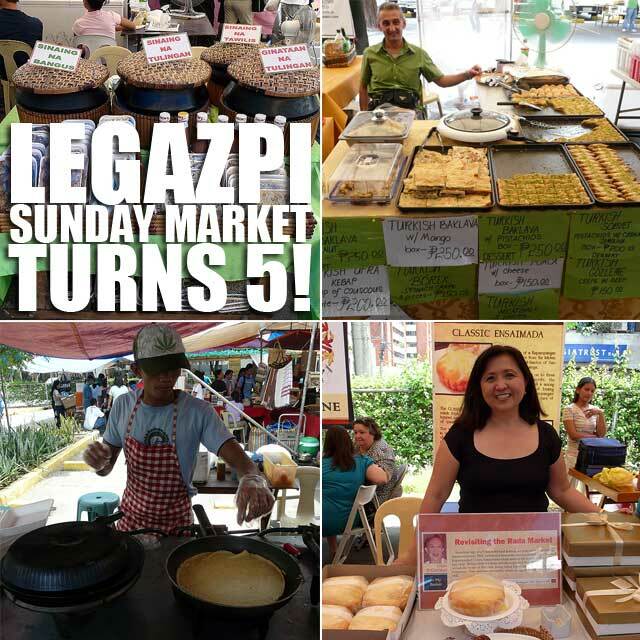 Makati: Legazpi Sunday Market turns five on Sunday! Legazpi Sunday Market will be celebrating it's fifth anniversary this Sunday, July 25, 2010 with a Grand Buffet featuring dishes from all of Legazpi Market's food vendors. The one-go buffet starts at 11 a.m. and costs only Php180 per head. Raffle prizes will also be given away to lucky shoppers. To learn more about Legazpi Sunday Market, check out Legaspi Sunday Market is Makati's undiscovered food haven. And when you're at Legazpi Market, don't forget to take home Imang Salud Ensaimada. It's best to reserve since supply runs out really quick. is there a need for reservation? I am just waiting for it. Brod, "one-go" as in you can't go back for more??? Yes brod, just fill-up your plate. It's like the salad buffet Wendy's used to have. A. GRAND BUFFET featuring dishes from all Legazpi Market's food vendors. ONE-GO BUFFET. NO SHARING. NO LEFT-OVERS. Our shoppers are entitled to pick from our fishbowl for every P500 purchased from our market vendors. Simple prizes and souvenirs for the lucky ones.Get yourself a track card when you arrive at the market. It's until supplies last. So best to come early. Thanks!